BMW’s new Z4 iPhone application An Expression of Joy is definitely an expression. A joy? There are some moments. Mostly though the application is BMW speaking to itself, not to us. The application is a very literal interpretation of the Z4’s campaign that features South-African artist Robin Rhode who used the car as a brush driven across a giant canvas. This was BMW’s role reversal concept where instead of BMW cars becoming art cars painted on by famous artists, the Z4 became the brush that drew the painting. It’s an interesting concept but I think the whole campaign is a bit esoteric, oh wait, that’s right BMWs are German, so maybe that is to be expected. So taking this esoteric concept to the iPhone is rather boring. Guess what you can do in the application? 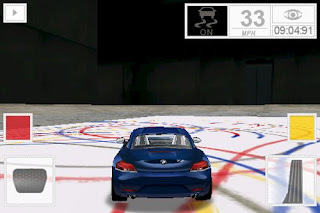 You can drive a Z4 across a canvas using a gas pedal, brakes, change paint colors on tires, and using the iPhone’s accelerometer you can turn the car to drive around the white canvas. Okay, that was fun for one second. Users stop using iPhone applications pretty quickly, with only about 1% of downloads resulting in long-term audiences according to Pinch Media. When do they become effective? When they meet the needs of the user. Granted, most branded automotive applications are an extension of the campaign website and that’s all. At least with the Z4 application, you can create art and even save it to your photo gallery on the phone to use as wallpaper (see my example to the right. I'm quite the artist, don't you agree?) After you’ve done that you are very likely to delete it like most iPhone automotive applications. At least it’s nowhere near as bad as the Kia Soul application that only lets you change the car’s color. You shake your phone and the car changes color. Neato! The issue with branded iPhone applications is making the applications relevant to the user, not the automotive company. BMW tried with this literal interpretation of their campaign and tried to make it playful and savable for later use through the game, but it really is all about the campaign finding a home on the iPhone and less about BMW finding long-term a home on your iPhone. Who has the Biggest Stimulus Package?